Does your home have a masonry built, open-burning wood fireplace? If you answered yes, it’s most likely highly inefficient. Explore your options in this two-part blog series! In Part 1, on April 26th, we covered the basics, including “fireplace inserts 101,” and types of inserts. In Part 2 below, we’re digging in deeper with performance, installation and fuel considerations. Gas Fireplace Inserts. Many are AFUE rated (annual fuel utilization efficiency), which means they’re tested to the same standards as furnaces. Direct vent gas fireplace inserts have sealed combustion systems that expel 100% of exhaust outside the home, keeping indoor air safe and clean. Technologies like IntelliFire™ significantly boost efficiencies and heat output. Wood Fireplace Inserts. 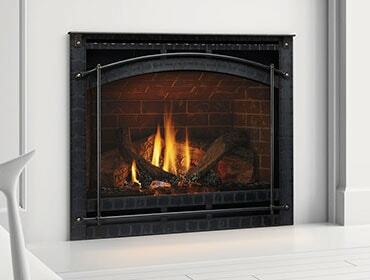 EPA-certified wood fireplace inserts can be up to 78% efficient. Today’s burn technologies provide a clean burn, expelling minimal pollutants into the outside air, with some models producing as little as 3.1 grams per hour. Pellet Fireplace Inserts. Today’s pellet inserts have state-of-the-art technology that produces steady, regulated heat for many hours on a single load of pellets. Due to pellet density and high burn efficiencies, pellet inserts emit minimal low outside air particulates.